When the police read your rights they tell you anything you say can and will be held against you. This doesn’t apply to confidential conversations with your lawyer, but police are acting like it does. It is a felony to record conversations protected by attorney-client privilege. Reports of police listening in on private conversations surfaced recently across California. Attorney-client privilege guarantees confidentiality between an attorney and client. It’s one of our basic legal rights, and we can add it to the list of basic rights police ignore. In 2018, Alameda County charged Sgt. James Russell with four counts of illegal recording and eavesdropping on attorney-client conversations in a case concerning an attempted robbery in Castro Valley. Body camera footage shows Russell instructing another officer on how to skirt attorney-client privileges and police custody laws, implying the violations are a department routine. This instance isn’t isolated to Alameda County. 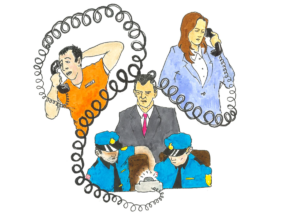 More than 300 miles south, the Orange County Sheriff Department recorded over 1,000 calls made between inmates and attorneys last year. The Sheriff Department accessed 58 of the recordings 87 times. It isn’t a new issue either. In 2008, the San Diego Police Department’s automatic recording system recorded attorney-client conversations. In 2018, in a separate case, San Diego’s Superior Court found the department in violation of attorney-client privilege again. Police need to be held to the same standards as everyone else. There is no equal treatment under the law when protocols as fundamental as attorney-client privilege are ignored. Lady Justice’s blindfold is slipping. Attorney-client privilege is one of the most basic legal rights in our judicial system. Without that privilege, it would be impossible for a defendant to freely relay the facts of their case to their counsel, undermining any hope of effective legal representation. Violations can affect the outcome of a case. When jail time and fines are on the line, slacking on protocols is a matter of freedom and incarceration. The freedom to communicate with whoever is representing you can make the difference between winning and losing a case, between an innocent verdict or a guilty one, between life and death. To enforce the law, do police officers need to break the law? No, but police officers like Russell are answering yes. Committing a felony in the name of the law is hardly playing by the rules. Police are citizens too and must be held accountable for their crimes. It is impossible to trust the police when officers ignore protocol and fail to hold each other accountable. Police ignoring their duty to the law means ignoring their duty to citizens. Laws cannot protect us if law enforcement bends them to get an upper hand. This is one more way the police are failing us. When accountability decays, so does the system. Violations on attorney-client privilege are indicators of a broken justice system and detriments to the system itself. Hold police officers accountable and know your legal rights. Attorney-client privilege is a basic part of the judicial system, so let’s keep it that way.